The unfolding of the Pao/Kleiner Perkins sexual discrimination and harassment case in Silicon Valley is like playing a game of Gender Bingo… If we could just get companies to see through their blind spots we wouldn’t have to watch these soap operas! If you want to play along, we have created some bingo cards for you. Now find yourself a caller, some balls (NO double entendre intended), and a bingo cage to whirl them around in, and you’re all set. 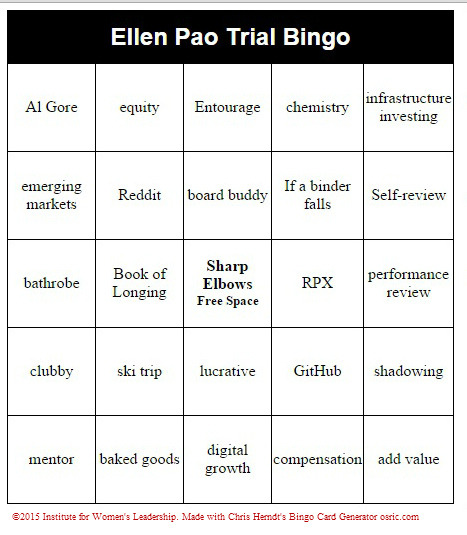 Click on the card below to download an entire set of Gender Bingo – Ellen Pao cards cards. Print out the pdf, and then it’s “Eyes Down!” as our British friends say.